This weekend the rank-and-file of the state’s second-favorite political party are descending upon the Anaheim Marriott in Orange County to rub elbows, pass bylaws, cheer keynote speaker/disruptor Steve Bannon, and formulate a strategy to attempt to re-take political power in California. Or barring that, to at least reclaim political relevance. Such is the challenge for California Republicans. With the Democratic lock on political power in Sacramento and the state’s reputation as a bulwark of the #Resistance, it’s easy to forget how far the Grand Old Party has fallen. From Richard Nixon to the Elder Bush, California consistently delivered its presidential electors to the Republican nominee. We elected Republican governors too. Sometimes both: Perhaps you’ve heard of Ronald Reagan? But those days are long over. 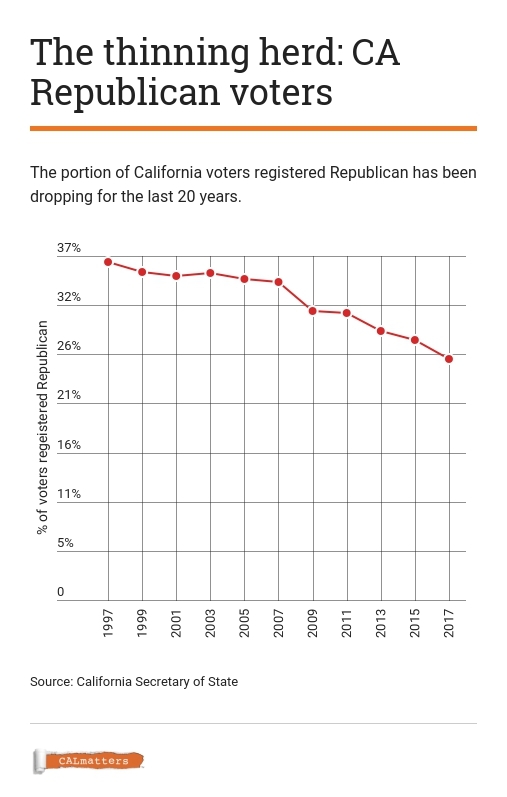 Since the late 1990s the share of registered Republicans among registered voters has fallen by nearly a third. The bulk of the decline has occurred since 2008. That raises the question many in the party will be asking themselves this weekend: Where have all of California’s Republicans gone? Rob Bernosky, the state party’s Central Coast regional vice chairman, points to possible culprits. The GOP leadership has not engaged enough with low-level organizers or voters, in his view. The Democratic Party’s alignment with public sector unions has put the Republicans at a door-knocking, ground-pounding, phone-calling disadvantage. And then there is the case of the Republican emigrant. “All the manufacturing companies that used to have good, middle class, solidly Republican workers have left,” he said. That’s not an unfamiliar story: Expelled by California’s outrageous cost of living (and, as they say, by even more outrageous liberal politics), conservatives are leaving the state in search of cheaper, redder climes. One unsuccessful Republican Congressional candidate turned the supposed ideological refugee phenomenon into a business, setting up shop in McKinney, TX, to help like minded Californians resettle in the Lone Star State. California is indeed experiencing outward migration (according the U.S. Census, 644,710 moved to another state between 2014 and 2015). But there isn’t much concrete evidence that most of these migrants are Republicans. Mark Baldassare, president of the Public Policy Institute of California, says there’s a much simpler explanation for the Republican Party’s misfortunes: demographics. Registration among non-white voters and registration among millennials have increased, while the Republican Party has remained relatively white, old, and affluent. “The profile of voters has been shifting, while the profile of the Republican Party has been more static,” he said. As for the theory that Republicans are leaving the state in droves? Mitchell has analyzed the demographics of those who have exited the state—by moving van or by hearse—and found that while they are more partisan than the state average, meaning more likely to be registered as either Republican or Democrat, they don’t cluster into one party or another. Left behind are one of the fastest growing groups of voters, those who register with no party at all. And unlike many other states where independents lean to the right, roughly two-thirds of independent voters in California vote as if they are Democrats. 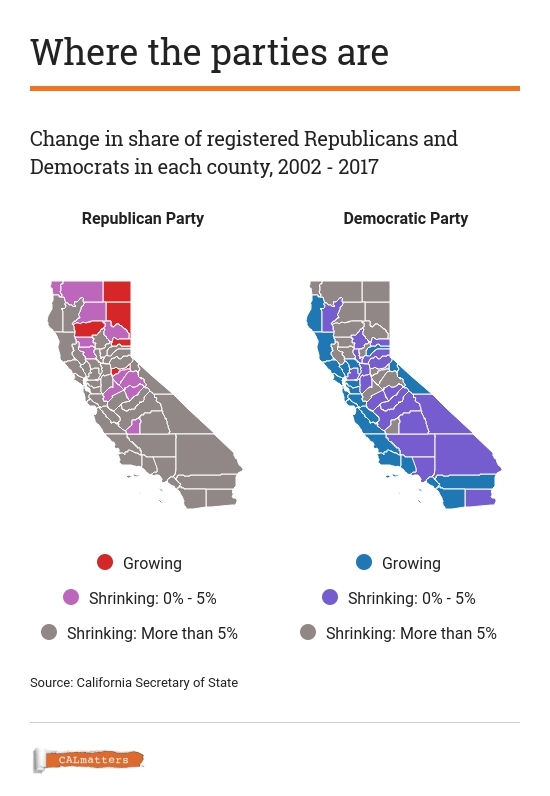 In other words, it’s less that California Republicans are leaving the state, and more that the state is leaving the party. The Republican Party does have a secret weapon against these demographic trends: turnout. Even during off-year elections when voter participation is generally anemic, Mitchell said, “white homeowners in affluent areas with good educations who have been registered to vote for 20 years, they’re probably still at 70 to 75 percent turnout.” That comes much closer to describing the average Republican voter than it does the average Democrat or left-leaning independent. Even so, many state Republicans feel the need to open up the tent. Their disappointment with the 2016 election may have provided an impetus—despite the surprise upset by President Donald Trump nationwide, California Democrats won supermajorities in both the state Assembly and Senate. Even Orange County, where the state party will be spending its weekend, voted for the Democratic candidate for the first time since 1936. Whether they can do that “by working on the messaging,” as Bernosky suggests, or by changing the actual message is unclear. National Republicans were asking themselves a similar question after their electoral defeat in 2012. In its so-called 2013 “autopsy report” commissioned by then-chairman Reince Priebus, party leaders argued that a less ideologically rigid GOP would be more appealing to young and non-white voters. Republican voters took that message into consideration and responded four years later by electing Trump. Now the momentum in the state GOP is moving away from moderation. Earlier this year, Assemblyman Chad Mayes was forced out as Assembly Republican leader after siding with the Democratic majority to extend the state’s cap-and-trade program, an environmental policy designed to reduce greenhouse gas emissions. He and several other more moderate Republicans won’t be attending the Anaheim conclave. Bannon, having left the Trump administration and declared war on the Republican establishment, will be. That may be a tough sell for many voters. According to a Public Policy Institute poll conducted in October of last year, public opinion of the GOP did not fare well during the lengthy presidential campaign. Among all adults, 69 percent reported unfavorable views of the party, including half of Republicans and 70 percent of independents. 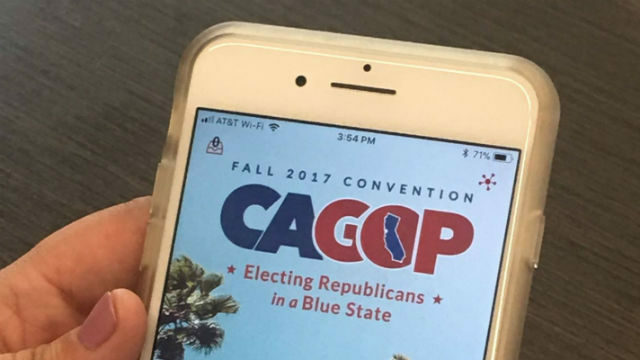 “That isn’t to say that there aren’t areas of California where there isn’t strong and consistent support” for the GOP, Baldassare said. “But all of these trends have made it very difficult for Republicans to compete in statewide elections.” Still, the Republican faithful find their own reasons for cautious optimism. Take Bernosky, who in 2010 ran for a state Assembly seat in southern Silicon Valley and did well. He didn’t win, mind you. But getting nearly 40 percent of the vote in a district where Democrats outnumbered Republicans by more than two-to-one is no mean feat. It suggests that registration and demographics aren’t destiny. Or at the very least, that with enough turnout and the right messaging, destiny can be delayed.